As an athlete, you may have heard about the role of post-workout carbs. But you may not realize that sugar is also a carb. It’s actually the simplest form of carbohydrate and occurs naturally in many foods, including fruits, vegetables, milk and milk products. There are different types of sugar, including fructose (fruit sugar), sucrose (table sugar) and lactose (the naturally-occurring sugar in milk). While some diets restrict carbohydrates, post-workout carbs are actually an integral part of athletes’ diets. All carbohydrates, including sugar, easily convert to glucose. Glucose not needed immediately is stored in both the muscles and the liver as glycogen. If you don’t replenish these glycogen stores effectively, you can run out of fuel, also known as “hitting the wall.” Eating sugar after a workout helps you refuel your muscles to make sure you’re ready for the next one. You hit the gym hard and put in the effort, tough workout after tough workout. Once you’re done with the cardio, crunches and circuit training, it’s time to focus on another important part of your routine — helping your muscles rebuild, refuel and recover. Fitness and nutrition experts agree that proper nutrition is essential after strenuous exercise. And those looking to get the most of their intense exercise efforts are often on the hunt for the best thing to eat after a workout. Lowfat chocolate milk is a good choice for athletes who are looking for these muscle recovery foods. Not only does it provide the post-workout sugar to refuel muscles, it also has the key carb-to-protein ratio scientifically shown to help muscles recover quickly, giving it the recovery advantage over water and some commercial sports drinks. The high-quality protein in chocolate milk offers many of the advantages of commercial recovery drinks, for less than 50 cents a serving. Milk and milk’s protein also have been shown to help athletes gain more lean muscle and lose more fat when compared to drinking a carb-only beverage, as part of a regular workout and recovery routine. Quench your thirst and recover right with an ideal mix of carbs and protein after your next intense workout. 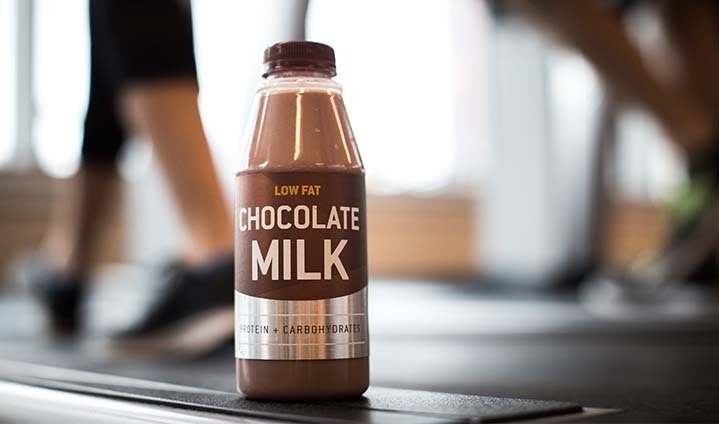 Learn more about the science behind recovering with chocolate milk.